Windows 7 vs Vista  Where the Two Stand and Why! Windows 7 vs Vista - Which is Better? 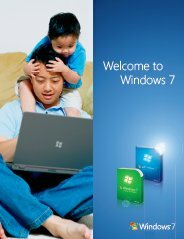 Windows 7 was recently launched by Microsoft and has been getting rave reviews from critics worldwide. The praise especially comes from people who were visibly disappointed with Windows Vista, the immediate earlier version of the trademark operating system by the IT giant. The main issue with Vista was the annoyingly long load-times and performance speeds, especially as XP had been consistent in this regard. However, we are talking about high-end requirements here, with the basic hardware not being the Pentium II CPUs with a mere 64-128 MB of RAM. As file transfers exceeding 1 GB and rich files become more commonplace, Windows 7 manages to edge out Vista in all quarters. From load times to hibernation time-periods, even the beta version performs splendidly, speaking volumes about whats coming ahead. Here, the Windows 7 vs Vista debate takes the familiar turn too. Unlike Vistas over-hyped but under-performing network management features, Windows 7 delivers on the promise of effortless networking along with a few additional features of its own. However, on the downside, many of the features (like Homegroups) have been criticized because of their exclusiveness to the latest version. The Windows Vista vs Windows 7 argument also facilitates us to consider some more factors, which also possess the capability of tilting the balance in anyones favor. Security was one of the highpoints of Vista, but Windows 7 takes it up a few notches higher. The upgrades include a custom-ready UAC (User Account Control) with changeable security levels, improvised TCP/IP guidelines and the random memory address allocation to system files. The latest version also scores better than its predecessor in terms of mobility as well as VGA performance. The last statement in the earlier point would have boded well with gamers, for whom it seems that Windows 7 has gone that extra mile. Great frame rates, absence of crashes or mouse-lags and better management of the RAM and the new-age DirectX 10 graphics card have augured well for the operating system, though it still remains to be seen whether it can beat XP (the current blue-eyed-boy of the gaming industry). Thus, even though the Windows 7 vs Vista issue may linger on till the next installment is shelled out by Microsoft, the former has to have the upper hand in the argument till now. What do you think about Windows 7 vs Vista? Do you have any Windows 7 vs Vista experiences, ideas, article, story, opinions, errors, problems and tips which you would like to share? Why not take a few moments and Share it with everyone!